We support retail supermarkets with the software they use for their point of sale billing (Ultisales, Arch).In addition to this, we distribute and support Tally, an accounting package targeted at small business, since it is affordable and easy to maintain. 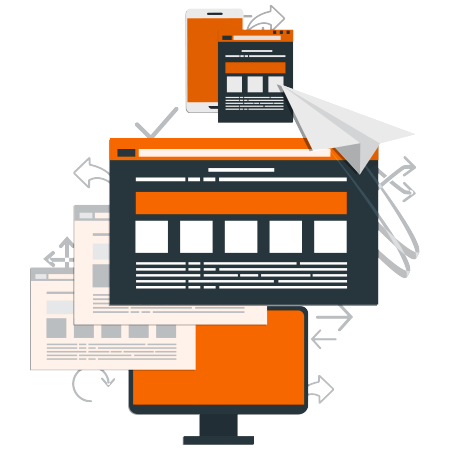 We also provide web development solutions, from conception to final portal deployment. iQube also partners with software companies to provide world class services locally to companies. Every company in todays technology era has to innovate their procedures. Develop Robots helps develop custom software solutions for every type of company. We help increase your efficiency and cut your costs. Our Booking software development services are suited for many industries such as medical, hotel, vacation home, car rental, salon and any business needing to keep track of reservations, bookings and appointments. Do you need a software that can manage your entire finances, all under one platform? We can even integrate to Quick books or any popular Accounting System so that you can view all your financial data under one platform. Application Programming Interface is a common term used for describing multiple systems integrating with one another. Develop Robots can help integrate your website, software and app to any type of API. Every Real Estate Company needs a software to manage their operations. Develop Robots can develop a custom Real Estate software to manage Listings, Transactions, and more all under one platform instead of having to deal with multiple software companies. Our inventory software development services will help you manage your entire store’s inventory, keep track of stock, and make smarter decisions when ordering more stock. Develop Robots can custom code an Inventory Management Software around your EXACT specifications. Client Relationship Management is key to running a successful company. We can custom code a CRM for you based on your exact specifications. We also provide content management systems. We develop software for medical institutions to manage their appointments, patients, patient info, and much more. Develop Robots can innovate your entire medical practice with one custom software that manages everything. When we program your software, we make sure its mobile and tablet friendly at NO ADDITIONAL COST to you. We understand that in todays market its important that your website works on all devices, we invest our time to make sure you succeed online with your business. •	Compatible on all Mac/PC and Browsers (Chrome, Safari, Internet Explorer, and the rest).